Rhubarb Sorbet is an easy, cool scoop. This homemade frozen dessert is made without milk, cream, or eggs, so has fewer calories than ice cream. Rhubarb season has kept me busy. I’ve made chutney, a cake, compote, salsa and jam. And now a sorbet. I like rhubarb season! The good news about rhubarb is that it freezes well. Pack clean rhubarb in freezer-safe containers or bags. If packing in bags, remove as much air as possible and freeze up to a year. You can enjoy the tangy, tart, pink spring-time fruit all year long. 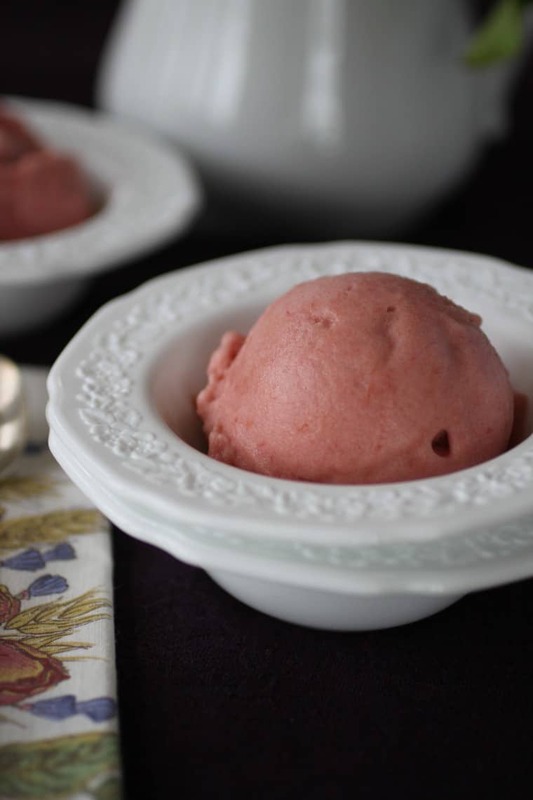 More good news is that rhubarb freezes well…in ice cream, or in this case, sorbet. Sorbet, sherbet (note, there is no ‘bert’ in sherbet), or sorbetto, the only difference is if you’re ordering in French, English, or Italian. It’s all the same – a frozen concoction that is generally made without milk, cream, or eggs, so has fewer calories than ice cream. Because the ingredient list doesn’t contain fat, the mixture freezes hard. Just take it out about 10 minutes before serving to give it time to soften. Never. ever. put ice cream in the microwave to soften. Here’s why. One of the best features of ice cream is the smooth, silky texture. That texture is the result of really small ice crystals. Large ice crystals give ice cream a coarse, icy texture. I imagine you’re feeling it now…remembering some not-so-perfect ice cream. The faster ice cream freezes, the smaller the ice crystals. The size of the ice crystals is dependent on ingredients and preparation, including the amount of fat in the recipe, how the ice cream mix freezes, how quickly the finished ice cream freezes, and how it is stored. If your ice cream lasts for a few weeks, you may notice a grainy texture that you feel on your tongue. This is typically due to the repeated thawing and freezings, whether from your freezer cycling on and off (that’s the automatic defrost), removing ice cream from the freezer to serve it, or warming it in the microwave to scoop it more easily. As the temperature rises just a little bit, the small ice crystals melt. When they refreeze, they do so in larger crystals. So, I don’t microwave ice cream because I don’t like grainy ice cream. If ice cream is difficult to scoop, maybe some weight training is in store so you can dish up sorbet all summer long! 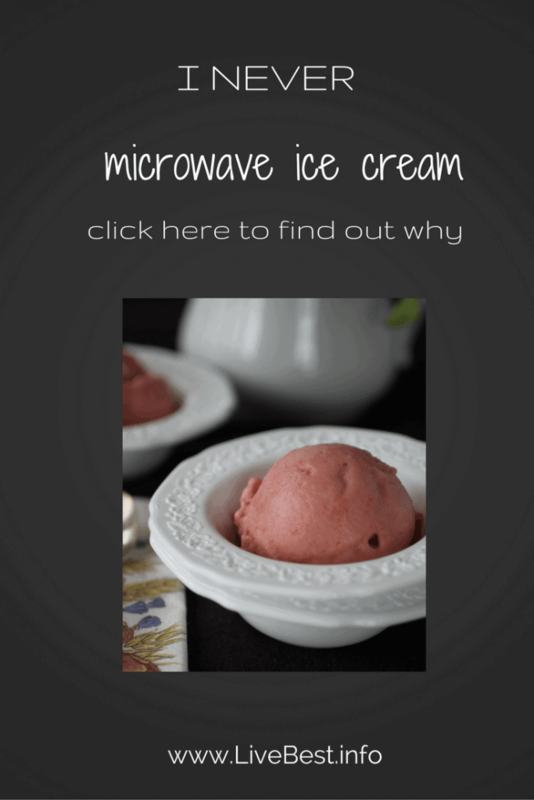 I use a fairly inexpensive ice cream maker that has a freezable insert. Mine is so old, that it’s no longer made, but this Cuisinart is similar. One of the most important things to successful ice cream making is to have everything cold. The ice cream or sorbet base needs to be well chilled. I also freeze my ice cream storage container which is a rectangular Tupperware container. When the mixture is finished churning, pack it in the freezer container, cover with a tight-fitting lid and get it in the freezer ASAP. 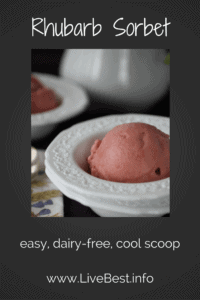 This is an easy sorbet recipe to get you going. Rhubarb and ginger are a classic combination, but if you don’t like ginger, just omit it. If you’d like, add a splash of wine, red or white, to the mixture as it cooks. Think you can’t eat rhubarb without strawberries? Replace part of the rhubarb in the recipe with sliced strawberries. This recipe is about as flexible as you can be. But what you don’t want to do is cook in aluminum. The acid from the rhubarb may react with the metal. With all that, you’re ready to cook. And savor the tastes of spring. P.S. If you like this recipe, you may want more nutrish and delish ones to help you with a healthy diet. 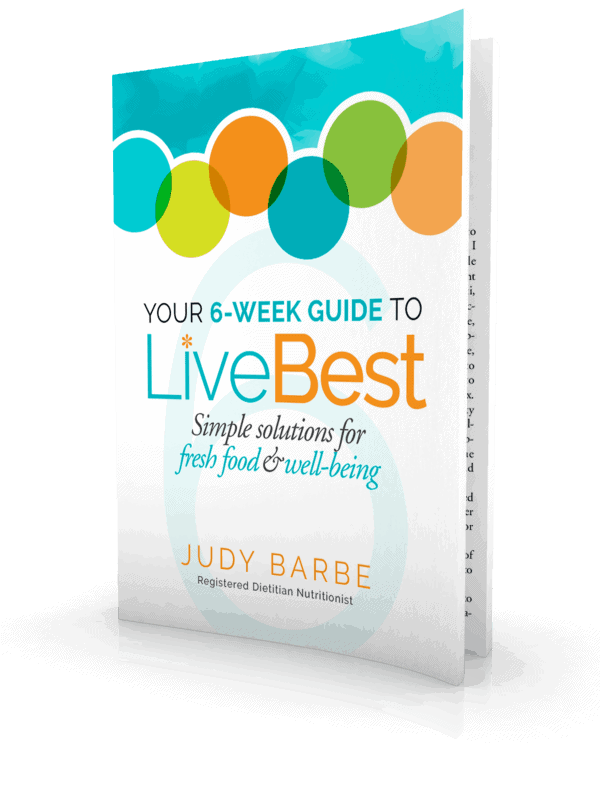 Sign up for my newsletter here. Fresh or frozen rhubarb can be used in this recipe. Combine all ingredients in heavy-bottomed, stainless steel sauce pan over medium heat. Stir to distribute sugar. Bring to a boil. Stirring occasionally, cook until rhubarb is tender, about 15 minutes. Allow to cool. Refrigerate until mixture is thoroughly chilled. Puree in blender or food processor until smooth. Pour mixture into the freezer can of an ice-cream freezer; freeze according to manufacturer’s instructions. Spoon sorbet into a freezer-safe container; cover and freeze 1 hour or until firm. Remove sorbet from freezer 10 minutes before serving.